Peter Burnett spent his youth in Missouri. He returned to Tennessee where he worked as a hotel clerk and as a clerk in a country store. Burnett purchased the store in 1829. In 1830, Peter returned to Missouri with 62 ½ cents in his pocket. Burnett took up the study of law and by 1839 was working as one of the defense counsels for Joseph Smith, Jr., and several other Mormon leaders who were under indictment for treason, arson and robbery. Defense counsel moved for a change of venue and while transporting the prisoners, they escaped to Illinois. In 1842, after reading a congressional report on Oregon, Burnett decided to move his family there. He quickly organized a wagon train, which left for the Oregon territory on May 8, 1842 and arrived in the territory in early October of the same year. Burnett tried his hand at farming, but was unsuccessful. He turned to politics and was elected to 1844 Legislative Committee of Oregon tasked with the organizing a provisional government. As a legislator in Oregon, Burnett proposed that all free blacks be forced to leave the state. Any who failed to leave were to be arrested and flogged every six months until they did leave. There was much public outcry. 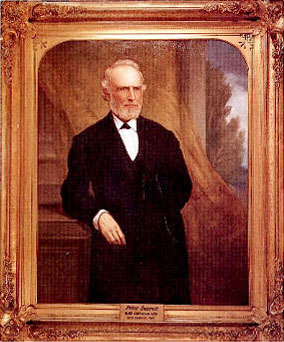 Burnett was elected governor of California in 1849 – before California had even become a state. After his first annual address received criticism from the legislature, he abruptly resigned from office. Burnett is honored with a memorial in the church at Mission Santa Clara. Use the California State Library’s interactive tool to view Executive Orders and Proclamations signed by Governor Burnett.